All of us at home are brinjal/eggplant lovers. Hence I cook sundaikkai / turkey berries / pea eggplants also quite often and create a variety of dishes with them. Sundaikkai's are miniature of eggplants and they almost taste the same when they are cut into half except that there are too many seeds when compared to the bigger egg plants. 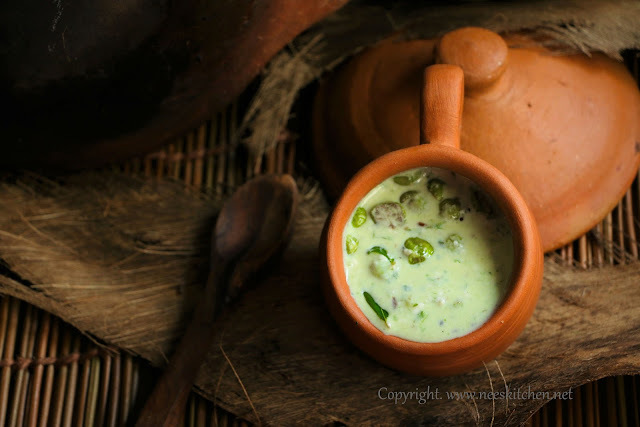 This recipe is about Sundaikkai cooked along with spices and mixed with yogurt and a paste made out of coriander,ginger,green chilli. Turkeyberries are ideal for who are diabetes and/or anemic. It has a very rich iron content. You can follow my diabetic & anemic collection for quick updates. 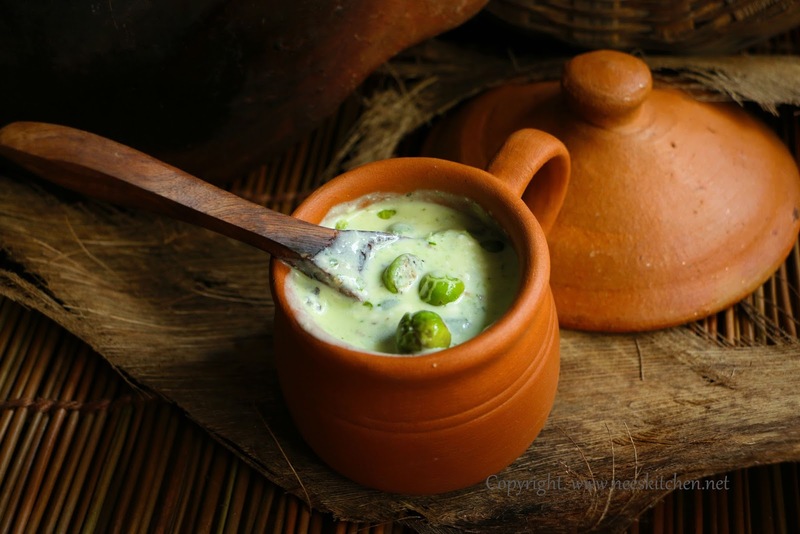 In this recipe ,it is a must to cut the sundaikkai into two parts as they should be fried in oil well to get a good flavor and taste for this dish. I have included raw coriander,ginger and green chili paste as they further enhance the taste and flavor. Make sure not to add more ginger than the quantity mentioned as it would override the rest of the flavors. 1. Chop each Sundaikkai/Turkey berry into half. Do not slit. Put them in a bowl of water to retain the color. 2. Blend coriander leaves, ginger, green chili, cumin seeds, salt (I used ½ tsp) in a mortar pestle or mixer. Add little water if needed. 3. Take a claypot pan and add oil. 4. Add hing, mustuard, urad dhal and curry leaves. Do not wait for it to cook. 5. Immediately add Sundaikkai/Turkey berries, curry leaves and let it fry nicely. The color would change and the you can see a white color skin coming..
6. Let this mix cool. 7. 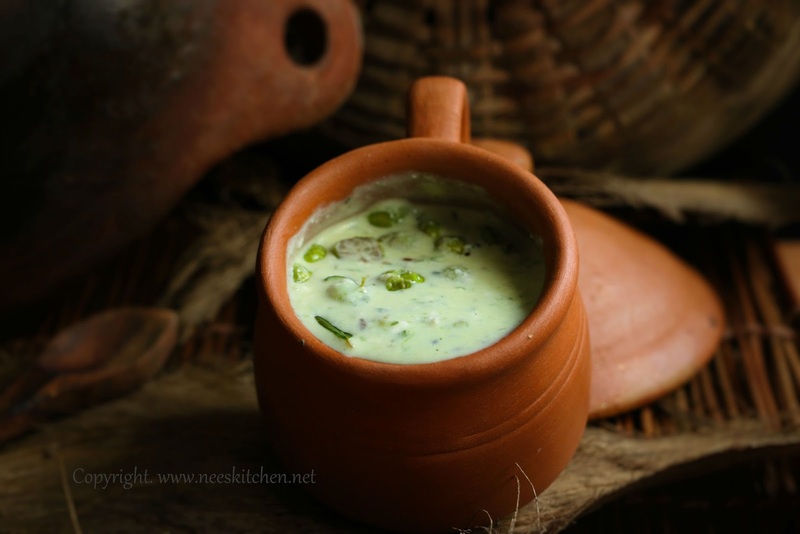 Whisk the yogurt by adding little water to form a raita consistency. 8. Add yogurt, ground coriander paste and the fried turkey berries (along with the spices). 1. For best results serve after 20 minutes. 2. Make sure the sundaikkai/turkey berry is completely fried else it would turn out to be bitter. 1. Blend coriander leaves, ginger, green chili, cumin seeds, salt (I used ½ tsp) in a mortar pestle or mixer. Add little water if needed.For mortar pestle version refer to the video. 2. Beat the yogurt and mix the coriander,ginger, chili paste. 4. Chop each Sundaikkai/Turkey berry into half. Do not slit. 5. Take a non-stick pan and add oil. 6. Add hing, mustuard, urad dhal & Jeera. Do not wait for it to cook. 7. Immediately add Sundaikkai/Turkey berries, curry leaves and let it fry nicely. The color would change and the you can see a white color skin coming. 9. Add this to the yogurt mix. Let the flavor get infused for atleast 20 minutes. Sundaikkai Thayir Pachidi is ready . Serve either chill or room temperature.